Stunning, high quality, Display and packaging products from the print experts. Get in touch. Greenfield Creations is situated in Ridgewell, Essex, but we offer our services worldwide. We are able to produce an extensive range of custom made display and packaging products, and wholesale packaging supplies direct to the end user and to the trade. We manufacture all forms of display products including point of purchase displays, point of sale (POS) displays, portable displays, digital display systems, retail display stands, merchandisers, dump bins, custom shipping boxes, posters, stickers and much more. We produce fine registration multi-colour screen-printing to your exact specifications. We work with all types of materials including plastics, folding boxboard, corrugated cardboard, paper and fabric. We can take your work from the initial concept to the finished product. Greenfield Creations has been printing, laminating, die cutting and hand finishing for many years and we are confident that we can offer our customers a competitive, creative and comprehensive print and finishing service. 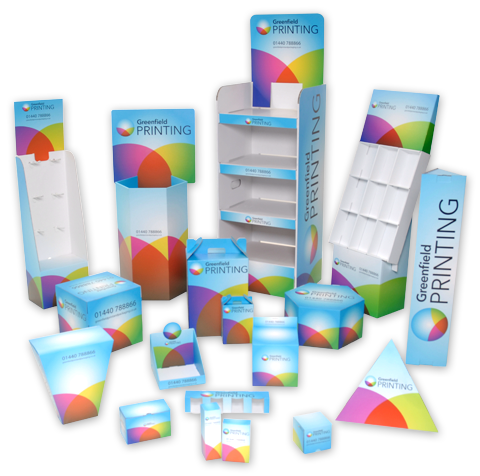 Be it printing, cutting, gluing, assembling or packing, all services are carried out in-house, enabling us to offer all kinds of packaging, promotional and display products at competitive prices. Whether you want to attract your customer’s attention, or make a product safe for transit, we make use of our exceptional in-house facilities to manufacture the right product for you. We have everything it takes to deliver your order on budget and on time! Please do not hesitate to contact us to discuss your requirements – we’re confident we’ll have the solution. This website aims to illustrate a few examples of some of the products we regularly produce. Why not put our efficient service to the test? We can design, print and build a bespoke prototype for next day delivery.